Scrub, peel, and poke potatoes several times with a fork. Microwave for 10 minutes, poke with a fork (if still undercooked, microwave for an additional 2-3 minutes), and set aside to cool. Slice into even sized wedges. Alternatively you can follow THESE directions for baking your potatoes in the oven. You can use canned or previously cooked beans for this recipe. Using a crock pot is my favorite way to make beans. Over medium heat in a medium saucepan reheat the 3 cups of beans for 5-10 minutes or until hot, set aside. Make 1 batch of white bean alfredo sauce. Wash and dice tomatoes, set aside. Wash and chop cauliflower, if using. Wash and slice avocados in half (lengthwise around the huge pit in the middle). Carefully dice the avocados while the peel is still intact and then scoop the flesh out, set aside. 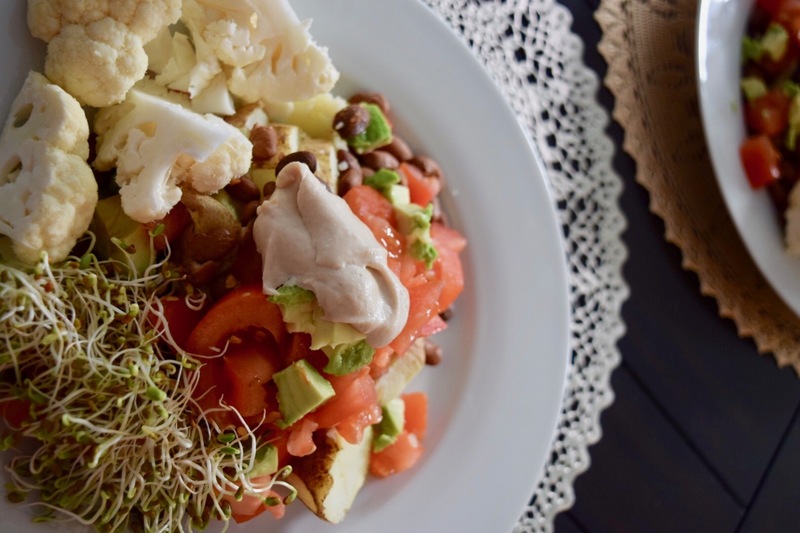 Spread about a cup of potato wedges onto each plate, cover the potatoes with about 3/4 cup of beans, and divide the tomatoes, alfalfa sprouts, avocado, and cauliflower between the four plates. Add 1/4 c of white bean alfredo sauce to each plate and serve. And congratulations, Kimberly for running in the San Diego marathon yesterday. You did it! Thank you! It is so easy!